WELL I MUST SAY it has been some time since a reporter, outside of the Kamloops area, has sought me out for comment. 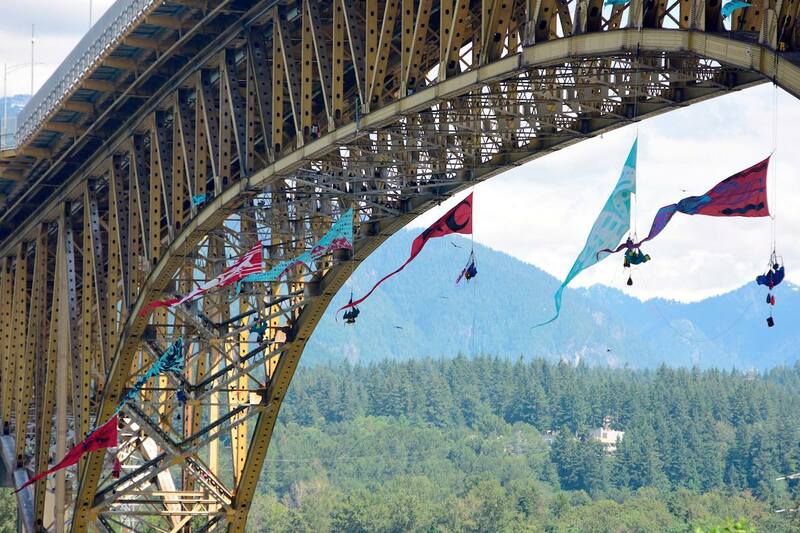 It happened Thursday, however, and it had to do with seven Greenpeace protesters who took it upon themselves to hang from the Iron Workers Memorial Bridge, and block a tanker which was legally about to head out to sea. This demonstration of course to protest the ALSO LEGAL Trans Mountain Pipeline expansion. I am a reporter with The Star Vancouver newspaper and covering yesterday’s illegal bridge protest and arrests. Do you stand by that sentiment? Can you please comment on allegations that any reasonable person would interpret that as suggesting police should have caused people to fall to their death or serious injury? And also criticisms that even if it was in jest, such phrases are inappropriate for you as someone who has run for public office in the past? I do not believe most people would take seriously, the comment I and others made. Instead, it should show the frustration that a very large (and I would personally say a majority) of people in B.C. feel about eco / enviro radicals, who time and time again, hold the provinces resource and development industry hostage. I grew up in the interior (Cariboo) where this is some of the most beautiful country around … filled with a multitude of lakes, high plateaus, and wilderness. And where I now live, in Kamloops, is much the same. I also worked for a short time at Gibraltar, an open pit copper mine (’74 – ’79) located at McLeese Lake. Most of the workers there were outdoors people … none of whom would have ever thought it a good idea to destroy the outdoors they loved to play in and enjoy. The same holds true today. In fact, the people who work in the resource industry are some of the strongest environmentalists. Big city protesters on the other hand live in concrete jungles … surrounded by hundreds and hundreds of square miles of asphalt roads and parking lots … enjoying all of the amenities, services, and products the resource industries provide. Oh, I forget to mention many live in homes in the Abbotsford area (and other metro Vancouver areas) crowded into clear-cut hillsides, which had forests until recently. “Cut them (the Greenpeace protesters) down and let them fall in the river”. Yah it’s a little strong, but maybe those in the media who champion these eco radicals should instead ask if they actually realize how much their lives AND lifestyle would be negatively impacted if the resource sectors they protest, were to close. I am proud to have once worked in the resource industry, and in fact to also have been a union Shop Steward and Bargaining Rep. Friends and family I know … and tens of thousands of interior and northern residents, are also PROUD to work in the resource industry. Maybe, its time some one stood up for then?? His tag line on his email address states: Investigate. Report. Effect Change. IF he does indeed fairly represent the very valid frustration I and other express, then he will have lived up to that statement. That’s it for me. 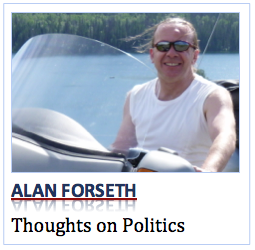 In Kamloops, I’m Alan Forseth. Have a comment to make about this? Please feel free to express your thoughts below in the Comments section. Thank you Mr. Forseth. A huge amount of us out here completely agree with you and your opinion. Couldn’t have put in better words!!! Did someone really say “let them fall into the river?” That’s no river, kids. That’s Burrard Inlet, which is a tiny piece of the Pacific Ocean. Greenfleece is a gang of criminals working for American and Saudi interests. Yes, Greenfleece. Ripping off Canadians for 50-ish years. I want to thank Mr Ball for his insight and cast aspersions on wha tI consider typical Forseth right wing crap. I do not believe that most people would take seriously a comment from me of similar stupidity referring to say proponents of a pipeline for example.Instead it would show the frustration of a very large (and I would say a majority ) of people in BC feel about the corporate agendas and proponents of resource projects who have time and time again held the provinces environment and whales / fish resources hostage. Just to beat you to the punch you might say “Who cares what you say ?”.I would answer that those people who stop me on the street and shake my hand and even hug me saying “W e are so lucky to have people like you fighting for us..
Every body has the right or moral imperative to fight for what they believe is right..
jobs are needed ,we in interior need to stand up ,& take part,the coast should not decide this or any issue alone! !